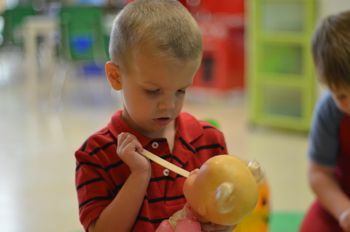 ABA therapy sessions target behavioral, communication, and social skill goals by arranging an environment that allows children many opportunities to practice targeted skills with natural reinforcing consequences. We address challenging behaviors by analyzing the function of the behavior and teaching new communicative behaviors to replace the challenging behaviors. Session typically last 50 minutes with a 5-minute parent conference, but might be longer based on a child’s individual needs. Each child receives a 3-month progress summary and a treatment summary at the end of the year or upon graduation from therapy. Please contact us or fill out our Interest Form for more information.